Suzuki has a great reputation for manufacturing motorbikes, but somehow the car division has never been able to breakthrough into the mainstream. As is generally the case for small Japanese manufacturers, Suzuki likes to focus on building cars that are decent to drive, but won’t break the bank, which is an approach that we fully endorse. Unfortunately it would appear that the general public remains a bit more sceptical. Suzuki’s first sniff of success has come in the form of the popular Swift, and clearly buoyed up by this, someone in the management team has taken a brave pill and decided to attack the highly competitive but potentially lucrative crossover segment. Everyone agrees that the Nissan Qashqai is the clear number one, and Suzuki appears to be employing the sincerest form of flattery by sticking very closely to the size and shape of the Nissan. Looks are very important if you want to sell a crossover, and the Suzuki carries off the chunky but car-like stance well. It has to be said that there is clearly a lot of Qashqai in the design with the side view in particular looking like a court case pending, but with the runaway success of the Nissan it is easy to see why Suzuki has copied the key elements. Despite being a touch shorter it even boasts more boot space than the Qashqai with a healthy 430 litres boosting everyday practicality. The area where the S-Cross really impresses is efficiency. The 1-litre 3 cylinder Boosterjet engine provides decent shove thanks to 125 lb ft of torque from 2,000 – 3,500 rpm, but it also enables good fuel economy. The engine is linked to a new generation four mode all-wheel drive system. In ‘Auto’ the S-Cross is front wheel drive until grip is lost and then becomes four wheel drive, ‘Sport’ optimises the system to reduce understeer, ‘Snow’ is four-wheel drive by default but allows torque to be moved front and rear as required for traction, whilst ‘Lock’ is designed to get you moving if you do get stuck. 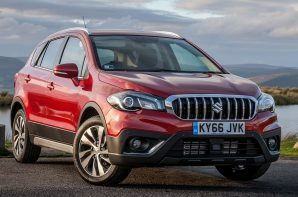 There is much to like with the SX4 S-Cross and we think it is a genuine option in a market where the Qashqai has become the default option for many buyers. At first glance it does look a bit expensive but that is because Suzuki has decided to only make the ALLGRIP diesel available in a high specification, once the spec is taken into account it is actually very good value.